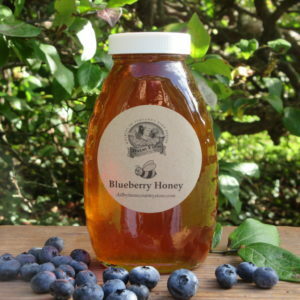 If you like blueberries then you will love our blueberry preserves. Each pint-sized, glass jar is loaded with lots of fruit which accounts for its remarkable flavor. Our all-natural blueberry preserves are not only delicious on any type of bread or muffin but also, they can be heated up and served over pancakes or even used as a topping for ice cream! Great when stirred into oatmeal too! Blueberries are an excellent source of antioxidants too, so they’re good for you; be sure to stock up and get a few. A Taste of Blueberry Pie in every bite! Made from lots of fresh blueberries, our blueberry preserves are not only sure to please your tastebuds but also they can help keep you healthy. Blueberries contain antioxidants, which work to neutralize free radicals linked to the development of cancer, cardiovascular disease, and other age-related conditions. These little powerhouses provide tasty ways of staying healthy. Eaten by themselves, they’re low in calories — coming in at about 80 calories per cup and practically fat-free — blueberries are loaded with fiber to keep you fuller longer. Just a handful can satisfy your daily fiber requirement. Plus, blueberries are an excellent source of manganese, which plays an important part in bone development and converting fats into energy. Be sure to get some blueberry preserves today! Remember, by including this little fruit in your diet you could help your health in big ways, from improving brain health to fighting urinary tract infections to possibly preventing cancer. Visit the site below to learn more about the many benefits of blueberries! The ingredients in our Blueberry Preserves are blueberries, sugar, pectin and citric acid. NO Preservatives; refrigerate after opening. May contain seeds. One pint glass jar; net weight 20 oz.